I N D E X T H E F E D E R A L R E S E R V E B A N K o f S T . L O U I S | C E N T R A L T O A M E R I C A ' S E C O N O M Y F A L L 2 0 1 4 6 7 10 St. Louis Initiative Increases Youth Labor Force Participation Broad Avenue's New Face CDAC Spotlight: Hands-On Commitment to Financial Education >> continued on Page 3 By Andrew A. 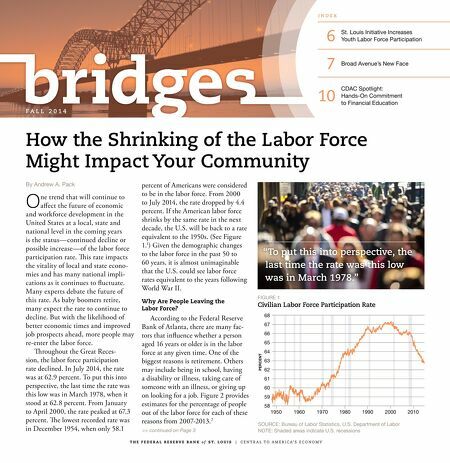 Pack O ne trend that will continue to affect the future of economic and workforce development in the United States at a local, state and national level in the coming years is the status—continued decline or possible increase—of the labor force participation rate. is rate impacts the vitality of local and state econo- mies and has many national impli- cations as it continues to fluctuate. Many experts debate the future of this rate. As baby boomers retire, many expect the rate to continue to decline. But with the likelihood of better economic times and improved job prospects ahead, more people may re-enter the labor force. roughout the Great Reces- sion, the labor force participation rate declined. In July 2014, the rate was at 62.9 percent. To put this into perspective, the last time the rate was this low was in March 1978, when it stood at 62.8 percent. From January to April 2000, the rate peaked at 67.3 percent. e lowest recorded rate was in December 1954, when only 58.1 percent of Americans were considered to be in the labor force. From 2000 to July 2014, the rate dropped by 4.4 percent. If the American labor force shrinks by the same rate in the next decade, the U.S. will be back to a rate equivalent to the 1950s. (See Figure 1. 1 ) Given the demographic changes to the labor force in the past 50 to 60 years, it is almost unimaginable that the U.S. could see labor force rates equivalent to the years following World War II. Why Are People Leaving the Labor Force? According to the Federal Reserve Bank of Atlanta, there are many fac- tors that influence whether a person aged 16 years or older is in the labor force at any given time. One of the biggest reasons is retirement. Others may include being in school, having a disability or illness, taking care of someone with an illness, or giving up on looking for a job. Figure 2 provides estimates for the percentage of people out of the labor force for each of these reasons from 2007-2013. 2 How the Shrinking of the Labor Force Might Impact Your Community FIGURE 1 Civilian Labor Force Participation Rate SOURCE: Bureau of Labor Statistics, U.S. Department of Labor NOTE: Shaded areas indicate U.S. recessions 68 67 66 65 64 63 62 61 60 59 58 1950 1960 1970 1980 1990 2000 2010 PERCENT "To put this into perspective, the last time the rate was this low was in March 1978."